For thousands of years, Romania, the easternmost outpost of the Roman Empire, was traversed by a number of tribes in search of riches or land to claim. In much the same way that these people’s language became absorbed, they left behind many traces of their own ways of preparing food for a lasting influence on Romanian cooking. This cookbook provides a solid introduction to a fascinating cuisine that blends Turkish, Hungarian, Greek, Slavic, and French influences into a cooking style that is at once earthy, complex, and satisfying, but is also easy to prepare. 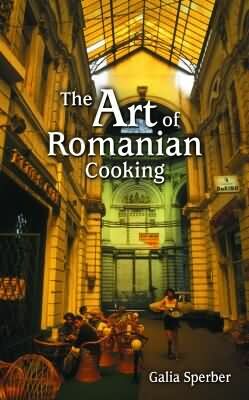 The Art of Romanian Cooking features recipes for appetizers for a wonderful light meal, such as papanasi prajiti (savory fried cheese patties) or croquette din salam (salami croquettes). There is a tremendous array of soups, ranging from a mouth-watering creamy potato soup to the six variations of borscht. Fish lovers will enjoy such delights as Russian-style trout, and the meat recipes include chicken (try fried chicken with garlic sauce), duck, veal, and the ubiquitous beef. And don’t forget dessert! The Othello torte is not to be missed, and the fragrance of rose jam alone makes it worth preparing. Altogether, the over 200 recipes in this book represent traditional and family recipes for home and special-occasion dining collected by Romanian native Galia Sperber, with reflections on her family and her native land. Dr. Galia Sperber’s family originates from Romania, but she grew up in the U.S. and Belgium. She is a medical doctor working in research related to the prevention of cardiovascular disorders. She currently lives in the U.K.